Taken as a whole, the eighth season of The X-Files is remarkable. It is not a perfect season of television, by any stretch. The eighth season doesn’t hit as many highs as the fourth, fifth or sixth seasons. As great as Robert Patrick is as John Doggett, and as skilfully as he is introduced, it is impossible to replace the easy dynamic between Mulder and Scully. 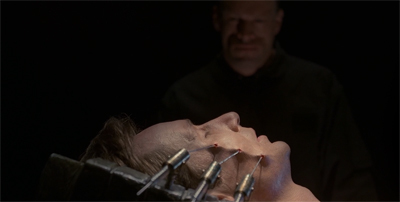 The actual mythology of the season feels overcrowded and convoluted, with “supersoldiers” feeling a tad cliché and Mulder’s terminal illness going nowhere of note. The season’s recurring motifs of darkness, death and body horror are not for everybody. At the same time, there is a staggering consistency and reliability to the season. From the outset, the eighth season seems to know what it wants to be and where it wants to go. There is a stronger sense of purpose to the eighth season than to any other season of the show, with the possible exception of the third. Even the lead-up to the release of The X-Files: Fight the Future did not feel this single-minded and focused. In terms of consistency of theme and imagery, this is the closest the show ever came to pulling off a season-long arc. It is tempting to credit this renewed vigour and energy to the absence of David Duchovny; the search for Mulder provides a solid and compelling hook for the season ahead. However, there is more to it than that. Mulder’s disappearance is a part of it, but the big thematic bow wrapped around the eighth season is Scully’s pregnancy. After all, David Duchovny returns to the show two-thirds of way through the season; it is Scully’s pregnancy that provides the season’s finalé. To be fair, even the revamped opening credits draw attention to it. The fetus finds itself incorporated into the opening sequence as a focal point – juxtaposed with other circular imagery like the world or the pupil and iris of Gillian Anderson’s eye. Although David Duchovny also appears at the climax of the credits sequence, he is shot falling into Gillian Anderson’s eye. It is a nice visual composition, but one which seems to suggest that Mulder’s disappearance is best examined through Scully’s perspective. Certainly, Scully is the viewpoint character for most of Within and Without. Doggett is a supporting character who wouldn’t seem especially important if his face didn’t appear in the title sequence. The first couple of times that Within and Without transition to the torture of Mulder on the alien ship, they transition via Scully’s nightmares. The obvious implication is that these images are playing out in Scully’s subconscious, even if the episode eventually reveals that they are actually happening. Of course, this imagery is not new to the eighth season. The X-Files has always had an interest in perception and reproductive horror. For a show built around the idea of belief, it makes sense that the show has returned time and time again to imagery related to eyes. This was perhaps most obvious in the third season, with the shots of various characters peering at the hybrid in 731 and the introduction of the black oil by way of clouded eyes in Piper Maru. Seeing (and perceiving) are essential parts of the X-Files experience. The show has also toyed with reproductive horror on a number of occasions, which is not surprising given the effectiveness of such horror to unsettle the audience. Reproductive horror has played out through standalone episodes like Eve or Chinga, but has also been woven into the mythology through a focus on clones and children in episodes like Colony, Herrenvolk and Memento Mori. In Redux I, Mulder found an entire basement of the Pentagon devoted to farming pregnant women. Scully herself has repeatedly been the focus of this reproductive horror. The decision to film shots of an abducted Scully with a very pregnant Gillian Anderson in Ascension cemented the reproductive subtext of Scully’s abduction experience. In fourth season episodes like Home and Leonard Betts, Scully was confronted with the idea of monstrous motherhood. In Memento Mori, she confronted her own mortality and the reality that she would never have children. Emily gave Scully a child, only to take that child away. To be entirely honest, the show was not always elegant in how it chose to handle Scully’s reproductive arc. In the first season, Jersey Devil had established Scully as a professional woman who did not want a family; it feels like a bit of a generalisation to force Scully back into a maternal mode. More than that, the handling of Scully’s maternal instincts in episodes like Emily or All Souls frequently felt reductive. It seemed like the show wanted Scully to be nothing but a mother, putting everything aside to mourn that loss of potentialities. As such, Scully’s pregnancy represents a pretty big gamble for the show. The X-Files has had difficulty dealing with the idea of Scully as a mother, and so it must tread lightly on the topic. It would be easy to allow Scully’s pregnancy to define her or limit her, to become the character’s core attribute at a time when she has been elevated to the show’s de facto lead actor. The eighth season does a pretty good job at handling Scully’s pregnancy without letting it overwhelm the show or the character. Scully’s pregnancy becomes a prism through which the rest of the season might be explored. Indeed, Mulder’s absence in the eighth season becomes a clever twist on one of the show’s core anxieties. So much of The X-Files is based around the idea of “the sins of the father”, the sense that the current generation is haunted by the decisions their parents made. After a strained relationship with his own father, the eighth season teases the possibility that Mulder might be no better; he may become an absentee father, a deadbeat dad. So much of The X-Files is based around the failure of fathers to protect their families. Bill Mulder and the Cigarette-Smoking Man are perhaps the two most obvious examples of men who betrayed their own families. Bill Mulder sacrificed Samantha Mulder, and in doing so shattered his own family unit. The Cigarette-Smoking Man gave over his own wife for experimentation before executing his own son for a perceived betrayal. Over the course of the show’s run, Mulder has wrestled with the betrayals by earlier generations. Within and Without both emphasise Scully’s isolation. Within opens with Scully staring at a mirror in her bathroom, a wry twist on the teaser to all things. Throughout the two-parter, male characters seem to talk around (or on behalf of) Scully. Mulder’s absence is more than just the disappearance of a friend or a lover; although unspoken by the show at this point, it is the absence of her child’s father. Fox Mulder might end up being as physically distant as his father was emotionally distant. Mulder created life with Scully, but now she faces the prospect of bringing it into the world by herself. Within and Without frame this as an existential horror of pregnancy; the idea that a woman can be left so alone even with live growing inside her. It is a very perverse sort of loneliness, one as fundamental and profound as that articulated by Jose Chung in his closing monologue in Jose Chung’s “From Outer Space.” After spending seven years looking for alien life with Mulder, Scully finds herself alone with life growing inside her. Of course, all of this makes the ninth season seem even more ill-considered and ill-judged. The eighth season largely stresses how horrifying it is for Scully to go through this experience without Mulder, before bringing Mulder back so that the two can have a happy ending in Essence and Existence. Almost immediately, the show makes a sharp u-turn as Mulder abandons Scully and his child (of his own volition, this time) in Nothing Important Happened Today I. The eighth season sets a trap into which the ninth season walks. This fear of paternal abandonment in Within and Without represents a very conscious shift in the storytelling style of The X-Files, one communicated through the changes to the opening sequence. The core themes of the show remain the same, but the focus has reversed. The first seven seasons projected a lot of the show’s existential anxieties outwards to conspirators and patriarchs; the eighth season focuses them internally. The credit sequence compares the planet to a fetus and features Mulder falling into Scully’s eye. The opening sequence still closes with the promise that “the truth is out there”, perhaps because it is to iconic a motto to change at this most volatile of moments. However, it seems like the truth is inside – in both a literal and spiritual sense. It is only through making peace with what lies inside that our characters can make sense of what lies beyond. Even the titles of the season’s opening and closing two-parters juxtapose the internal with the external. Within and Essence give way to Without and Existence. Indeed, this conscious effort to internalise the struggles of Mulder and Scully makes great use of the show’s move to California. When the production team moved to Los Angeles at the start of the sixth season, there was a sense that the show was not entirely sure how to retain its unique identity while shooting in a sunnier climate with longer days. The show attempted to smooth the transition in a number of ways, most obviously by shifting the tone so as to make the show lighter in more than just a visual sense. Fan reaction to the so-called “X-Files Lite” was polarised, but it was one way to address the transition. The eighth season takes the show in another direction entirely, marking a return to the darker visual style of the Vancouver years. However, Within and Without take advantage of the move to California to use the one location Vancouver could not provide: desert. The first four episodes of the eighth season make the most effective use of the desert since Drive at the start of the sixth season. Within and Without treat the Arizona desert as simply an expression of Scully’s internal isolation and loneliness. Carter eschews the mysticism he associated with the Arizona desert in Anasazi for something quieter. There is a beautiful section in the middle of Without where Scully wanders through the desert looking for Mulder. It could easily seem absurd or pretentious, but it ends up evocative and emotional. Credit is due to director Kim Manners, composer Mark Snow, and lead Gillian Anderson for their work in anchoring the sequence. With the conspiracy dismantled and large portions of the recurring cast consigned to history, Within and Without make the show feel smaller than it has been in quite a while. There is an intimacy and interiority to the eighth season that distinguishes it from the peak of the mythology, a sense that what is happening inside the characters is just as important as the epic events unfolding around them. In a way, this is a logical extension of the use of the mythology’s framework to tell more character-driven stories in the seventh season. This is something that the show has hinted at before. Indeed, Within and Without making a point to bring back Gibson Praise – a character who very much represents the idea of “the truth” given human form. In The End, even Scully characterised Gibson Praise as “quantifiable scientific proof of everything Agent Mulder and I have investigated over the past five years.” Bringing back Gibson Praise at this juncture suggests that the show is ready to reengage with these core ideas. Again, the eighth season hits on an thematic idea that will cause major problems during the ninth season. In stark contrast to the first seven seasons, the eighth season imposes rigid boundaries between “human” and “alien.” This is literalised in the show’s new mythology, which strips out the “human element” of colonisation in a number of ways. Most obviously, it removes the human conspirators from the equation. More abstractly, it plays down the emphasis on collaboration and hybridisation. There are no longer any characters mediating between the colonists and humanity, as they did in the first six-ish seasons. Hybridisation is put on hold; there is no Cassandra Spencer character. Indeed, the fact that the show’s last attempt at hybridisation in The Sixth Extinction II: Amor Fati gave both participants a fatal brain condition suggests that the show itself has rejected hybridisation as the way forward. Without even marks the last appearance of the Alien Bounty Hunter, a character who could assume multiple human forms. On a dramatic level, this imposes a whole host of new limitations on storytelling for The X-Files. In the transition from the Cigarette-Smoking Man to the Toothpick Man, the show loses a lot of what made the first seven seasons of the show so interesting. By stripping the human element out of the conspiracy, The X-Files loses its window on human greed and corruption. On a more superficial level, it becomes a much more conventional narrative with fewer possibilities and surprises. The eighth and ninth seasons of the show cannot produce conversations as interesting as those between the Cigarette-Smoking Man and the Well-Manicured Man, because there are no human players. The eighth and ninth seasons cannot offer so nuanced a critique of authority structures, because those structures are now rendered as explicitly alien rather than human in nature. The eighth and ninth seasons cannot produce a character with allegiances as unpredictable as Alex Krycek, because the line between “us” and “them” has solidified. However, these are largely problems for the ninth season. The eighth season walks a very fine tightrope, using the explicit boundary between human and alien as a metaphor tied into the eighth season’s themes of… well, “within” and “without.” After spending seven seasons exploring the idea that humanity is fundamentally and undeniably alien as part of a larger metaphor about colonisation, the eighth season turns that idea on its head. The eighth season suggests that there is an intrinsic and undeniable humanity that is deeply rooted in an individual. Interestingly, this could be seen as a clear political shift in the outlook of The X-Files. The first seven years of the show tended to focus on government corruption and offered a critical alternate history of twentieth-century America. The show drew attention to some of the more uncomfortable aspects of American history by repeatedly suggesting that the European settlers were essentially aliens who had colonised the continent, much as those in power conspired with aliens looking to colonise the world. There was a strong cynical and liberal bent to the mythology, which drew upon all manner of familiar American iconography. The show returned time and again to the legacy and consequences of the Second World War, particularly during the third season – the mythology touched on everything from the dropping of the atomic bomb to the amnesty offered to Axis war criminals. It is perhaps telling that the little grey aliens described by Paul Cornell as the embodiment of liberal guilt are entirely absent from the final two seasons of the show. If the first seven seasons criticised American democratic structures of government as prone to corruption or abuse, the final two seasons are worried about infiltration and invasion. The conspiracy in the first seven seasons was driven by a consortium of powerful white men who put their own interests against the greater good of the human race; the conspiracy in the final two seasons is driven by sinister outsiders who have managed to sneak into the corridors of power and pervert the state’s institutions. Arguably, this shift in the tone of The X-Files was part of a broader trend. Certainly, the show had embraced a more conservative religious outlook in seventh season episodes like Signs and Wonders and Closure. Carter’s work on Harsh Realm and Millennium also took on an explicitly religious bent, particularly in scripts like Seven and One and Leviathan. Those religiously conservative attitude might have prefigured a broader shift in the tone of the show. After all, the eighth season could be read as a horror story about how Scully might end up as a single mother. Mulder disappears right at the start of the Bush Presidency? Wake up, sheeple! It is worth putting this shift in a larger cultural context. There is an argument to be made that American culture as a whole became more conservative at the turn of the millennium. Within and Without effectively sandwich the infamous U.S. Presidential election of November 2000. Although the result of the election would not be officially decided until December 2000 – and remains highly contentious – the election found Republican George W. Bush ascending to the Oval Office, replacing Democrat Bill Clinton. Almost half the voters – 44 percent – said the Clinton scandals were either very or somewhat important in yesterday’s vote, and not surprisingly, about 3 in 4 of them voted for Bush, the candidate who promised to “restore honor and integrity” to the White House. Gore naturally did much better among those who minimized or dismissed the relevance to this year’s election of Monica S. Lewinsky and what Sen. John McCain (R-Ariz.) called “the Motel 1600 fundraisers” at the Clinton White House. It was the moral dimension that kept Bush in the race. Two-thirds of the voters said they thought the country was on the right track economically, and Gore led Bush among them by 27 percentage points – suggesting he should have won easily. But when voters were asked about the moral direction of the country, almost as many voters said the trend was adverse – and among them Bush beat Gore by 29 percentage points. The events of 9/11 would radically change the context and character of this new American conservatism. The eighth season of The X-Files suggests that the show could have transitioned into a more conservative political climate smoothly enough. However, the ninth seemed to demonstrate that the show could not survive a more sudden jolt. Of course, there has always been an element of conservatism to the politics of The X-Files and Millennium. Most obviously, Chris Carter’s scripts tend to assume the existence of absolute evil, evil that stretches beyond mortal man. This belief has arguably gotten stronger over the course of the series, with a clear contrast visible between the portrayal of Donnie Pfaster in Irresistible during the second season and the portrayal of the same character in Orison during the seventh season. The eighth season arguably takes this idea to its logical conclusion in Empedocles, which proposes the existence of evil as almost a moral contagion that passes from one person to another. In a way, this fits with the conscious theme of “self” and “other” running through the eighth season, with Empedocles firmly identifying “evil” as a concept as “other” as the alien supersoldiers who come to populate the conspiracy. Again, the eighth season is remarkably clear in its themes and motifs. The focus on Scully’s pregnancy and the rigid delineation between “human” and “alien” inform another major recurring motif of the eighth season. Quite simply, the eighth season is packed full of body horror. Although nothing in this block of episodes can quite compete with Home (or maybe even Sanguinarium), the eighth season is packed full of grotesque distortions and perversions of the human body. The production team are able to convey these horrors in surprising detail. The most gruesome bits of body horror lie ahead, but Within and Without both feel slightly more horrific and brutal than most conspiracy episodes. There is a sequence in Without where the Alien Bounty Hunter disguises himself as Scully and practically tears the throat out of another agent. There is not discretion show here; blood flies out of the wound and down the shirt. In fact, the episode allows us to identify the Alien Bounty Hunter later on by the blood dripping off his hand. Even the dissolution of the Alien Bounty Hunter at the climax feels more graphic than usual. We all see supertech now, but the idea of low-tech was much more interesting to me and much more visual. To take elements of rock and steel, and to chisel them into interesting shapes. I found the backdrop from Alien, and Bill Roe lit it very dimly and put it behind. And there was this rotating platform with this humongous dental piece that could rotate around as well and pull his face apart. The use of a set element from Alien is quite informative here. Earlier episodes like Ascension or Jose Chung’s “From Outer Space” tended to treat the alien ships as sterile environments filled with bright lights and clean surfaces. Even Mulder’s abduction in Requiem is traditional, with the character stepping into a circle of white light. As of Within and Without, the mythology’s production design becomes a lot more grotty and horrific. This is not the stainless steel interior of a train car, like those used as recently as Two Fathers and One Son. It feels like the entire production team celebrated emergence of the DVD market by circulating box sets of David Cronenberg films, hoping to emulate that look on prime-time American television. The eighth season of The X-Files is very much a horror show, in the way that the show has not been since it left Vancouver at the end of the fifth season. Grotesque body horror had been very popular during the eighties; perhaps tapping into a reservoir of fear created by the AIDS crisis. However, body horror was resurgent towards the end of the nineties and into the twenty-first century. David Cronenberg’s Crash offered a more grounded and less speculative sort of body horror, while other films tied the distortion of the human form into a larger cyberpunk aesthetic. eXistenz featured weapons made from flesh, Mimic tied into genetic engineering fears, The Matrix transformed the human body into a battery. If 1970s and 1980s horror was interested in the spectacle of violence, later additions to the canon seem bent on unsettling and disturbing the viewer through the immortality and inhumanity of their premises. As I have argued elsewhere, it is possible to trace a shift in focus from body horror and its preoccupation with the mutation and alteration of flesh to the more contemporary ‘bodily’ concerns of the new millennium: the body gradually becomes the object under attack by tyrannical individuals or, in some cases, corporations or institutionalised systems of punishment. One of the ways in which the genre has attained its current ‘bodily’ status is by turning to surgery as a source of anxiety. In fact, surgical horror could be seen as a logical conclusion to the postmodern subject’s fear of technological advances in medicine. This is certainly in keeping with the aesthetic of the eighth season, with the brain slug from Roadrunners and the invasive fakir in Badlaa standing alongside the transformation of human body into machine in the mythology. To be fair, The X-Files has touched on body horror before. Squeeze, the show’s first “monster of the week” story, featured a mutant who could distort and transform his body at will. Piper Maru introduced the black oil. Tunguska and Terma revealed that Russian attempts to develop a vaccine had a tendency to end in impromptu amputation. The movie Fight the Future borrowed quite literally from Alien in its exploration of the colonists’ life cycles. Hungry featured a monster who wore prosthetics to pass as human, and stripped them off to embrace his identity. However, none of this is quite as visceral as the eighth season, which seems to take great pleasure in subjecting the human form to all manner of horrors. Within and Without could easily capture Mulder’s pain and terror without stretching his face or forcing a rather phallic drill into his mouth. The creative choices in the eighth season are designed to emphasise these horrific and unnatural events. Over the course of the season, it is revealed that the colonists are planning to hollow out the human body and turn it into a weapon – a piece of hardware. The idea that the human body can be coded in a decipherable sequence of four letters, and hence in a finite collection of information, is based on the epistemological view that computer language – like molecular “language” – is an unambiguous representation of physical reality. Whereas the metaphor of mapping suggests an analog representation – a linear registration of a flat surface – the sequencing of genes ushers us definitely into the digital era. Digital encoding differs from analog recording in imposing a language of zeroes and ones, combined into great complexities, onto the human material body. It is also interesting to wonder whether the contemporaneous debate over human stem cells might have informed this new fixation on body horror. Stem cells were first isolated in late November 1998, and promptly opened an ethical can of worms. In August 2000, the Vatican released its Declaration on the Production and the Scientific and Therapeutic Use of Human Embryonic Stem Cells. In August 2001, President Bush would address the nation on the topic. Given their ability to develop into any cell-type of the adult body, stem cells tap into this idea of body horror. In some ways, of course, the eighth season’s fixation on body horror is just a logical extension of its core themes. Pregnancy is perhaps one of the most timeless and effective examples of body horror, with human body essentially playing host to (and becoming co-dependent with) a new organism. Pregnancy is a timeless bod horror motif, most obviously in films as diverse as Rosemary’s Baby, The Brood, Alien. With Scully pregnant, it makes sense that horror show would turn toward body horror. In fact, Scully’s first (and briefest) glimpse of Mulder in Within is coded in pregnancy imagery. Although it is the most ambiguous of sequences, constructed of quick cuts and shot in a blurry fashion, it is also the one most closely tied to her own physical state. The character is shown to be naked and covered in fluid, with an organic chord down his throat. Although the umbilical chord connects to a child’s stomach, the image of a biological tube providing sustenance cannot help but evoke pregnancy. This weird intersection between Scully’s pregnancy and Mulder’s abduction provides another thematic point for the larger eighth season. One of the more interesting aspects of the seventh season was the way that the production team constructed it to function as both a regular “business as usual” season of the show and a possible final season. The eighth season builds on that, constructed as both a possible final season of the existing show and the first season of a much different show. The X-Files is dead. The X-Files is reborn. Haha spot on! See also: Bush’s photo portrait in the FBI building somewhat ridiculed in I Want To Believe. Thinking about the politics of the X-Files (or Ten Thirteen shows, or Carter’s) is an interesting topic, and as with many things with the X-Files you can keep on looking at it and see both something and its opposite. On the one hand this is a show born out of some of Carter’s experiences when he was younger, the Vietnam war, the Watergate scandal, all important dates in the critique of Republicans. And on the other hand, the X-Files can be very conservative in its values, patriotism, family, love, religion — even right-wing libertarian with its obsession with conspiracies. It would have been interesting to see how the X-Files would have developed under a Republican presidency. Re: Without: What surprised me (in a bad way) with this episode is its limited scope. I’m all for returning to a more personal story after the globe-spanning mytharc episodes of seasons 3-6, but in Within/Without in particular what bothered me was the amount of time spent in the desert. More than an entire episode spent in a single location — that was never seen before in a two-parter! Even 731 with Mulder on the train shared its time with Scully elsewhere, and made it a ticking bomb thriller. In Within/Without it felt as if there was enough story to tell to exceed a single episode, and there definitely was, but not enough to fill two episodes. As much as “Within” was a great introduction to season 8, I found “Without” seriously lacking. There’s a Rolling Stone interview, I think, where Carter explains that he voted for Clinton twice while still arguing that Clinton was in many ways a Republican President. Trying to untangle the politics of any long running show (and, indeed, any person who isn’t in a position where their politics are extrapolated from an ideological position… ie, most of the population) is an interesting challenge. It’s more of an art than a science, and arguably a process that says as much about the interpretter as the interpretted. But I do like the smaller scale of Without. I think it is in keeping with the eighth season as a whole. More than that, I just love the imagery of Scully wandering through the desert. The teaser to Emily is my favourite part of the episode, and Without just runs with that imagery.